The purpose of research is to provide answers to the needs of society. Sadly, the majority of research finds end at publication in academic journals and are never translated into solutions in the form of usable products or implementable policies. 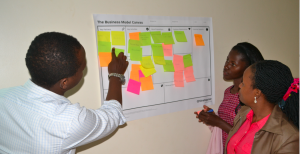 Funded by EDCTP, TWENDE consortium is advancing the culture of translating research knowledge into commercial products and policies to practice within the East Africa Community and Africa at large. Between 14th and 17th August 2017, a total of 25 researchers, administrators and journalists were trained in translation of research knowledge into commercial products and policies at Makerere University, Uganda. Dr. Ewan Chirnside of the University of St. Andrews Knowledge transfer/exchange centre took the class through commercialisation of research ideas, intellectual property rights, frugal innovation and the research – impact pathway. The class discussed and appreciated the value of creative thinking to up frugal innovation in Africa. Dr. Sabiiti taught class how to translate research evidence into policy briefs to influence policy making and improve service delivery in the country.